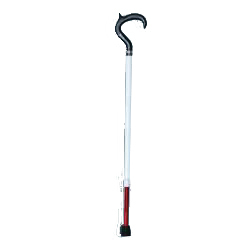 The standard length cane adjusts from 29 to 37 inches. We offer the modern handle. The lightweight, durable aluminum shaft is white and the lower section is red with a sure-grip Santoprene rubber tip.